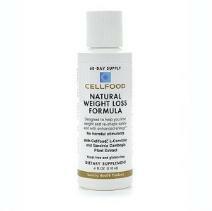 CellFood Weight Loss Formula 4 oz. Cellfood Natural Weight Loss Formula will help get your weight loss program off to a strong, healthful start— and then keep it running smoothly. This new proprietary formula combines Cellfood with fat burners L-Carnitine and Garcinia Cambogia Plant Extract to promote healthful weight loss— even while you sleep! Made from only the finest ingredients, this unique product works naturally and remarkably by assisting the body in: decreasing fat storage by inhibiting synthesis of fatty acids and cholesterol. increasing the body's metabolic action, transforming fatty acids into energy by accelerating the transport of these fatty acids into the cells' mitochondria. improving the cardiovascular system by maintaining healthy HDL cholesterol (protective cholesterol), LDL cholesterol (damaging cholesterol), and triglyceride levels, keeping arteries clear, normalizing blood pressure and improving the heart muscle. The heart gets two-thirds of its energy by burning fat, so Cellfood Natural Weight Loss Formula assists the body by feeding the cardiac engine and strengthening the heart muscle.